Ooey Gooey Lady Groupie Alert! I LOVE the Ooey Gooey Lady. 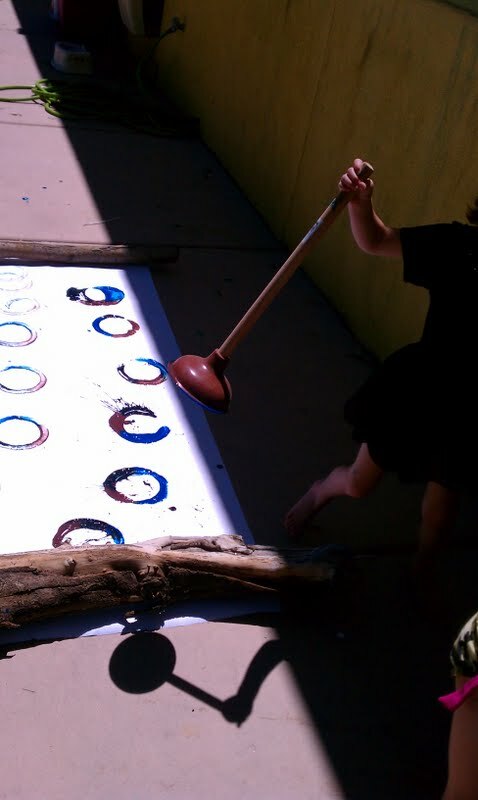 Her ideas for the classroom are developmentally appropriate, messy, and FUN. Do yourself a favor, and do this one outside! 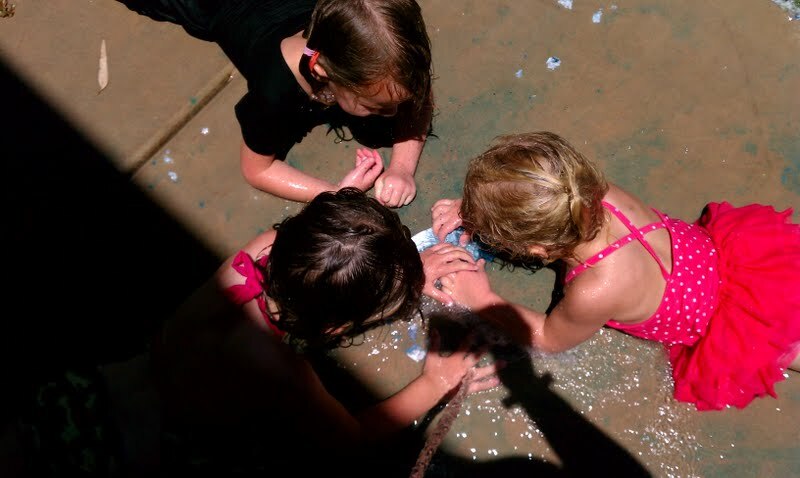 We did ours on a water day. ...because it takes some serious muscles to pull a wet plunger from a piece of paper with paint on it! 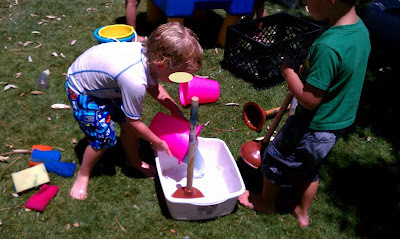 The plunger suctions to the paint, and you can either slide it off, anchor the plate with your foot and pull really hard, or walk around with a paper plate stuck on your plunger. They figured it out eagerly and quickly. I was impressed. I used logs to hold the paper down. 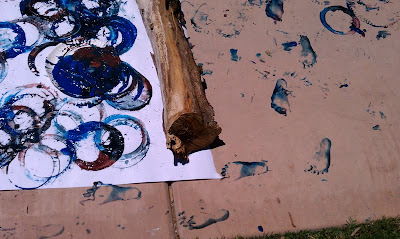 If I could do it again, I would use even more paper, because this was very popular! See why it's a good idea to do this one outside? I need to hire these guys to fix my toilet! The plungers were sparkling clean by the time we went inside. While the boys were busy cleaning the plungers, we found out that the paper plates had become stuck to the sidewalk. 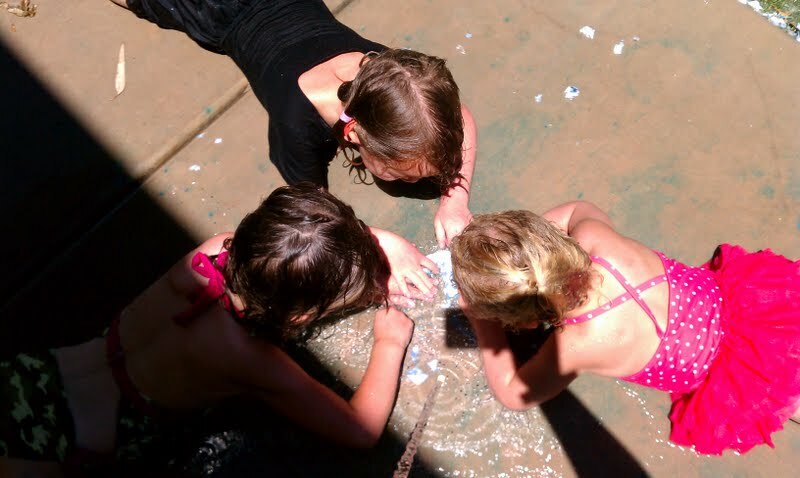 This is pretty typical in hot, dry climates like Arizona. 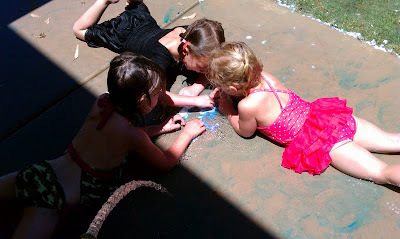 The paint-soaked paper plates dried quickly, and were glued to the pavement. 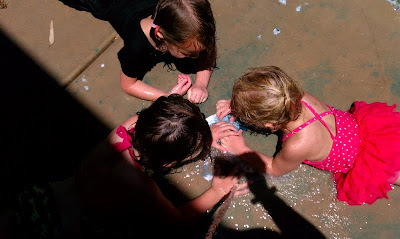 The girls scratched, scratched, and scratched away to get the paper plates off, while I aided them by keeping the area wet (to soften the paper). 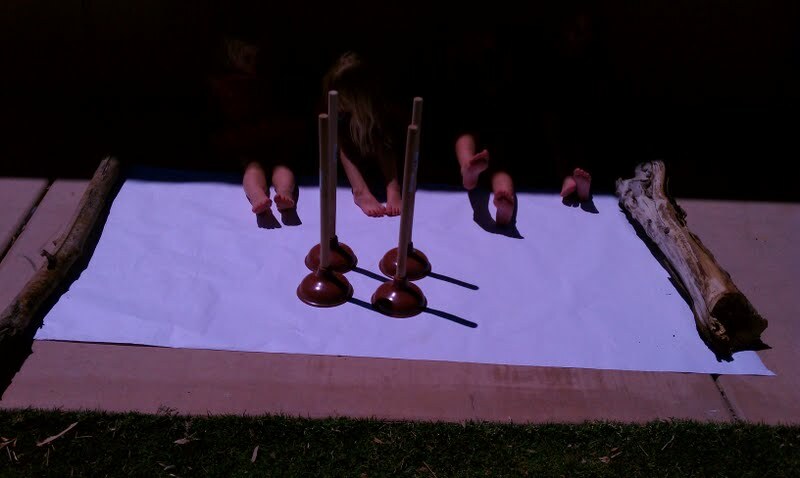 Arms, shoulder and back muscles are needed to push and pull the plungers, and incidentally, these are the same muscles needed for writing. 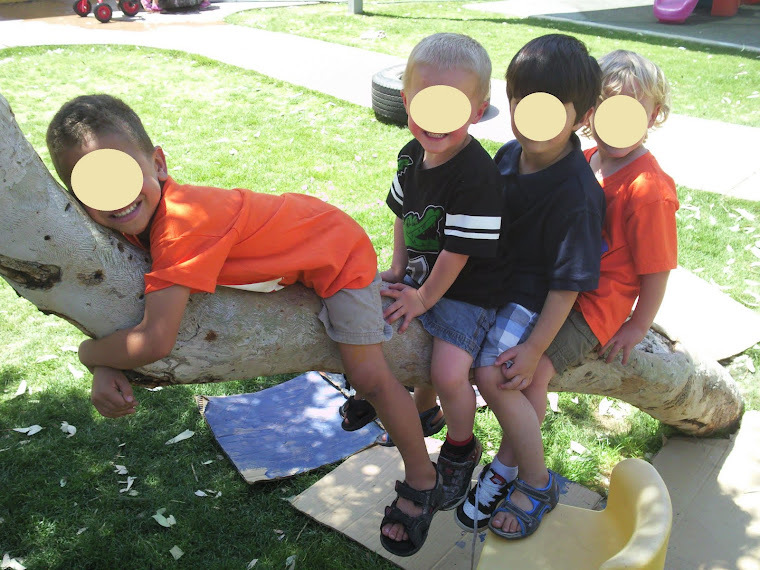 In a way, this activity was a very effective pre-writing exercise! Here we put real meaning to the words, "plunge," "suction," "grip," and "circles." 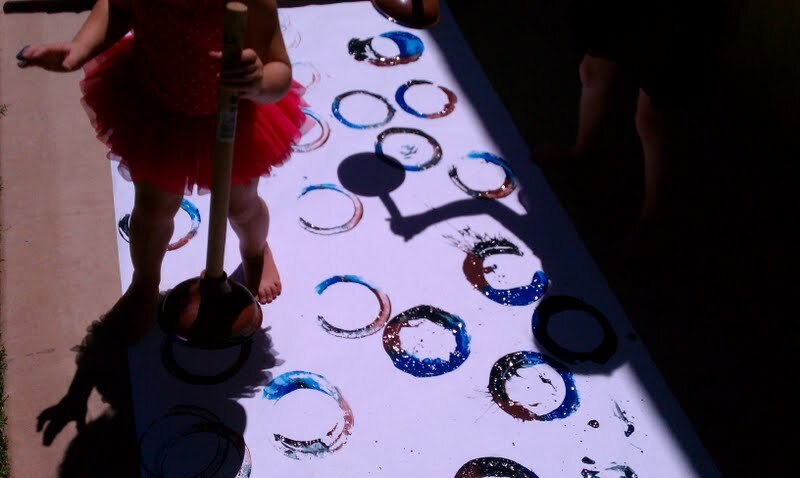 Making prints with plungers meets the AZ Early Learning Standards by allowing the children to use a variety of writing tools, materials, and surfaces to create marks. Clean up time took more time than the actual painting. However, in this case, clean up became almost more fun than the painting, so it worked out. 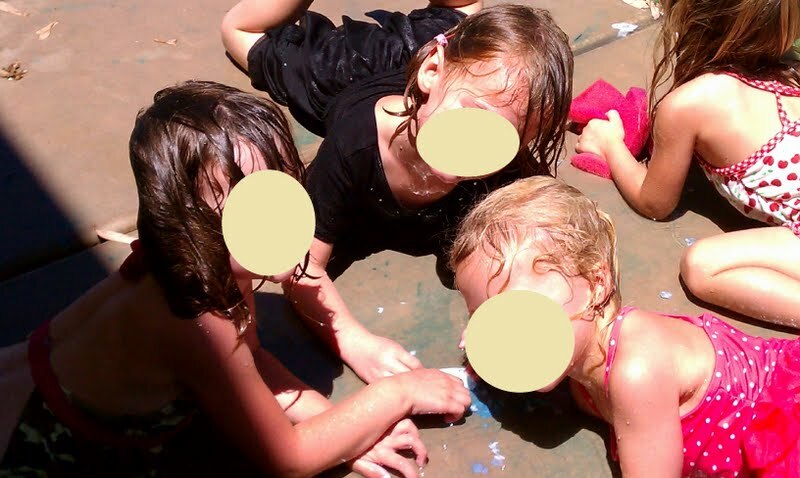 When we were done, I hosed everyone down, and we continued on with our day. 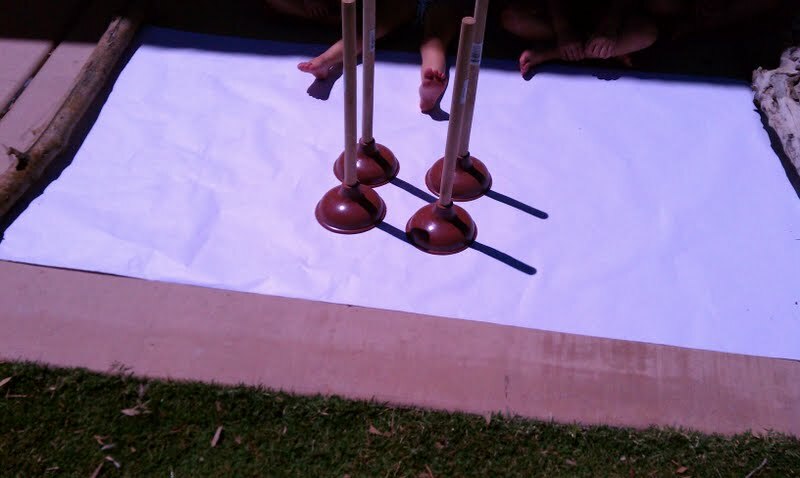 I only had four plungers available for a class of 13. Silly Ms. Gina. I should know better by now! If it's possible, try to have one for each child. 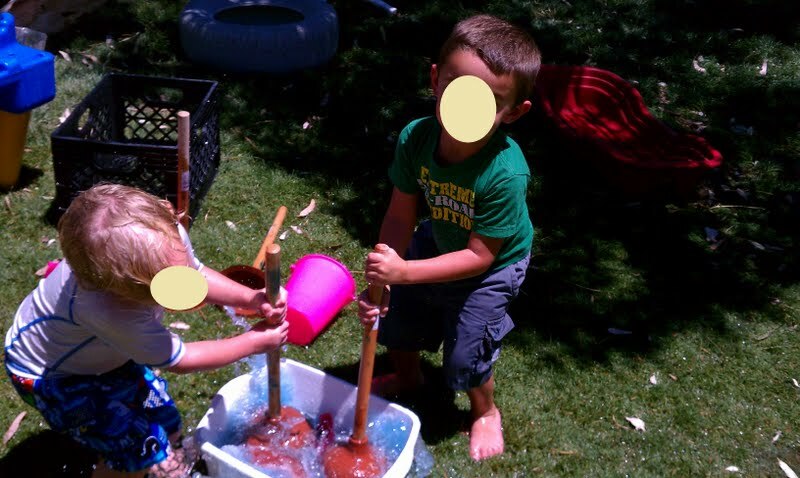 If the budget doesn't allow for that (these plungers were only a dollar at the dollar store, but they were a part of a larger purchase), try to have at least enough for half of the kids. I thought I taped it pretty good, but by the time we came out in the afternoon, that paper was gone. 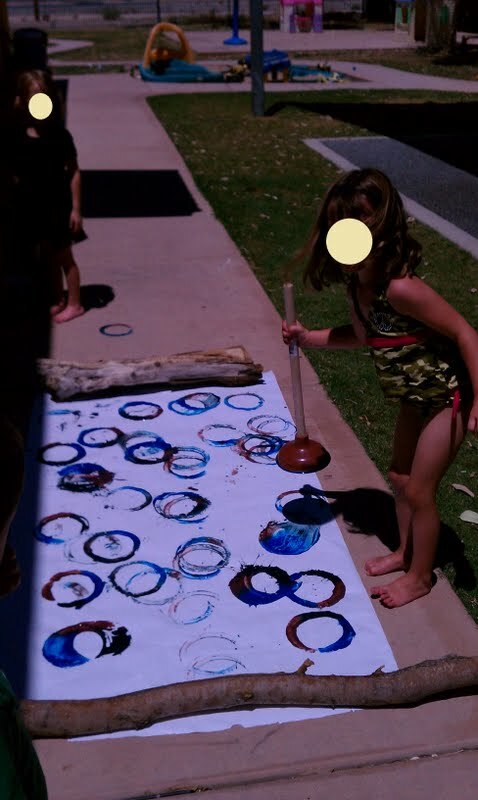 So much for our cool plunger print display! It's times like this that I have to remind myself, "Process, NOT product." The process was enjoyable, and the product...not that important. 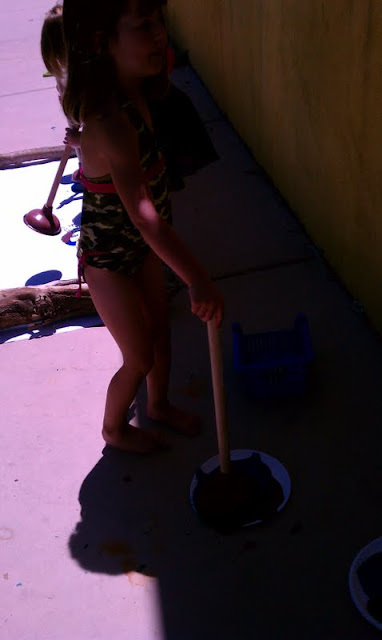 I forgot to explain what plungers are really meant for BEFORE the activity. 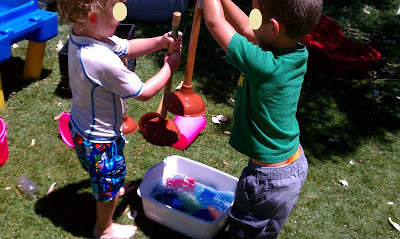 While I put them away on the bathroom shelf, one of the children exclaimed excitedly, "PLUNGERS! THOSE ARE FOR PAINTING!" 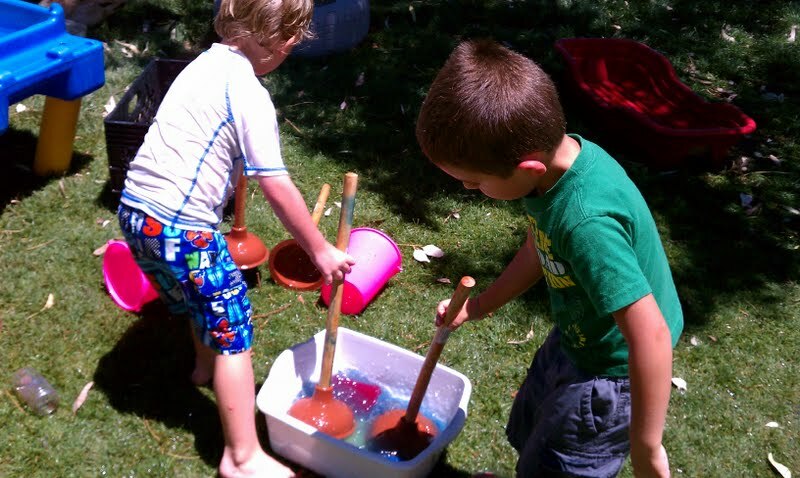 Very cool Activity...looks like a lot of fun! Fun activity and I'm glad to hear that you used new plungers! Brilliant - and thanks for all the tips - you have stopped me rushing into this & trying it inside!! 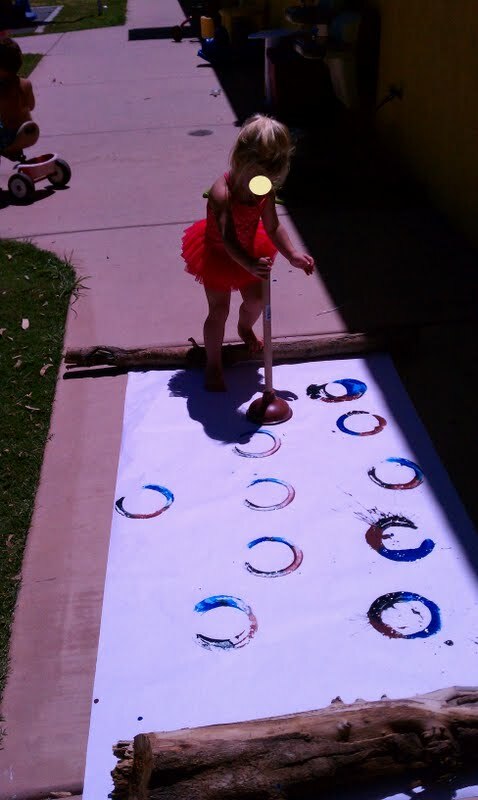 My kids love to do the giant paintings on huge floor paper. We've done our foot prints, rolling my spare tire, fly swatters, and scooba-flippered-feet, but never plungers, Love it! 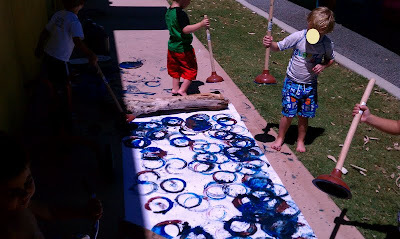 I love large-scaled art lessons like that! They look like they are having so much fun! Thank you for sharing this on The Sunday Showcase!